Trooper Kevin McKellar gets all sides of the story. 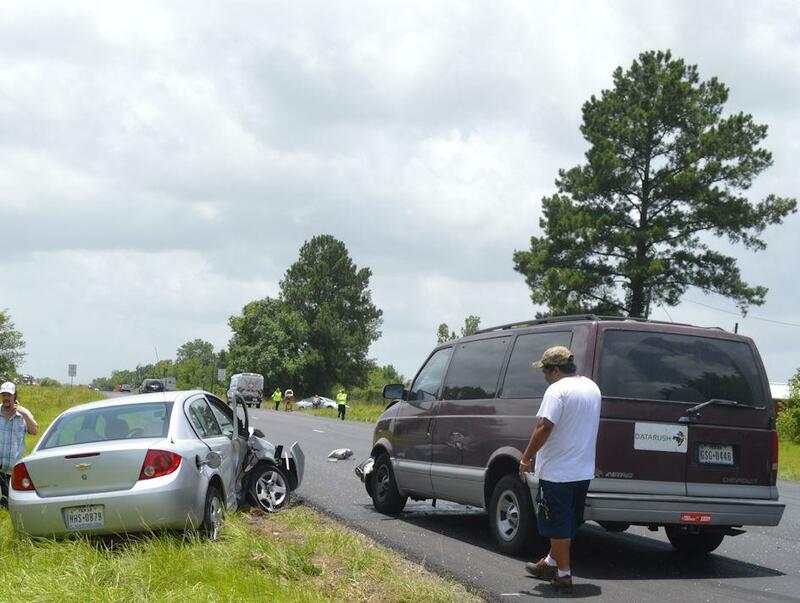 3 Vehicle Accident Hospitalizes 2, GOODRICH, June 30, 2017 - At approximately 1 pm on June 30, 2017, a silver 2012 Nissan Altima, driven by Monica Wiggins, 55, of Bentley, Louisiana, was south-bound on US-59. As Wiggins was passing the south end of Loop 393, a silver 2012 Chevy Cobalt, driven by Timothy Heefner, 65, of Livingston, came off the loop and failed to yield, broadsiding the passenger side of Wiggins' vehicle. The impact cause Heefner's vehicle to spin around and was broadsided by a south-bound 1998 Chevy Astro, driven by Jose Juevas, 43, of Houston. Wiggins' vehicle slid off the pavement to the right into the grass. Heefner's and Juevas' vehicles came to rest on left side of the pavement (Heefner's vehicle in the grass). Allegiance Ambulance Service was dispatched to the scene along with the Livingston Volunteer Fire Department Heavy Rescue Unit and Troopers Linley Rancour and Kevin McKellar with the Texas Highway Patrol. Wiggins' vehicle had jammed doors. Firemen used the Jaws-of-Life to force the doors open to free Wiggins and her husband. Wiggins' husband, and Heefner were transported by ambulance to CHI Livingston Memorial Hospital with undisclosed injuries. All traffic on the south-bound side of 59 was blocked during investigation and cleanup. Heefner is facing a citation for failure to yield right-of-way. A rollback wrecker from Ken's Towing recovered Heefner's and Juevas' vehicles and they'll be stored at Harrison Body Shop in Livingston. Wiggins' vehicle was recovered by Fawbush Wrecker Service and will be stored in Goodrich. 55 year old Monica Wiggins and her husband wait as firemen from Livingston use the Jaws-of-Life to open the jammed doors from the 2012 Nissan Altima. Monica Wiggins' husband is helped from his vehicle. He was transported by amublance to CHI Livingston Memorial Hospital. 65 year old Timothy Heefner, of Livingston, was driving the 2012 Chevy Cobalt (left). Heefner came off Loop 393 too fast and broadsided Wiggins' vehicle. The impact cause Heefner's vehicle to spin around and then get slammed by a 1998 Chevy Astro driven by 43 year old Jose Juveas, of Houston (left). Wiggins' vehicle is in the background in the grass. Monica Wiggins was physically unharmed and emerged from her vehicle under her own power. All traffic on the south-bound side of 59 was blocked during investigation and cleanup. Heefner's and Juveas' vehicles were recovered by Ken's Towing. Wiggins' vehicle was recovered by Fawbush Wrecker Service.